Our Caregiver Support Centers are dedicated to providing support to the caregiver, family members and friends who are the primary source of care for an ill family member. The team with both our centers provide a warm, supportive and nonjudgmental atmosphere where the caregiver can sit with a trained volunteer support coach and receive assistance using caregiver resources. Our volunteers are experienced in navigating our user-friendly online resources and resource library. To accommodate our guests, some of our resources are available in both Spanish and English, such as some brochures and pamphlets, which are specific to different illnesses and caregivers' needs. We also offer bilingual versions of the online caregiver resource library. Caregivers can access our online resources, such as United Hospital Fund's Next Step in Care, at our two computer stations. The Next Step in Care website features a series of guides and checklists for family caregivers, designed to inform them about what to expect, how to communicate better with healthcare providers, and how to plan safe and smooth transitions from hospital to home or rehabilitation. Other topics discussed include medication management, discharge planning and preparing for the next level of care. Providing support to the caregiver positively impacts the health of the patient, the family and the caregiver. During a loved one's hospital stay, the personal caregiver is a critical source of comfort. This demanding role may cause the caregiver to become stressed and unable to accomplish other responsibilities in his or her daily life. 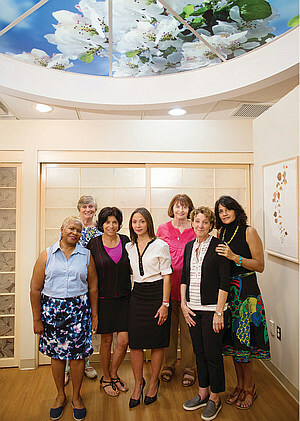 The Caregiver Support Center provides an oasis within the hospital setting. A confidential, safe and soothing environment for the caregiver, the Center provides caregivers access to a resource library, computers, a relaxation room and a trained volunteer coach, who is there to listen. The Center provides a soothing, quiet, tranquil environment where caregivers can unwind while their loved one is in the hospital. We provide a sound system with access to quiet music and meditation tapes in English and Spanish, which are available in our resource library. The Caregiver Support Centers, located at our Moses and Einstein campuses, offer a peaceful setting for you, the caregiver. An experienced social worker, the program coordinator, and trained volunteers are here to help. 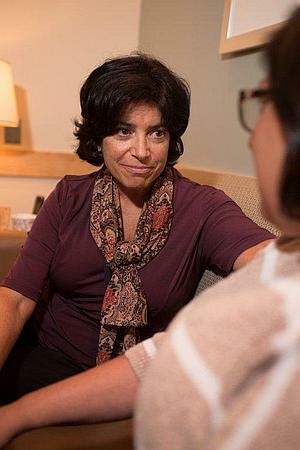 By working with the Center's multidisciplinary team, caregivers can connect to several support programs, both within the hospital and the community. Our computer station offers easy access to research different illnesses, as well as addressing the specific needs and concerns of the caregiver. The Center has many copies of the comprehensive Bronx Guide to Caregiver Resources, available in English and Spanish. Many of the books in the resource library are available in Spanish. We have materials available digitally in over 50 languages. Our program assistant, Lynette Olmo, is fluent in Spanish. Language is not a barrier, as the Center is equipped with access to an interpreter phone line. Have questions? We invite you to contact us to learn more about the services provided at our centers.